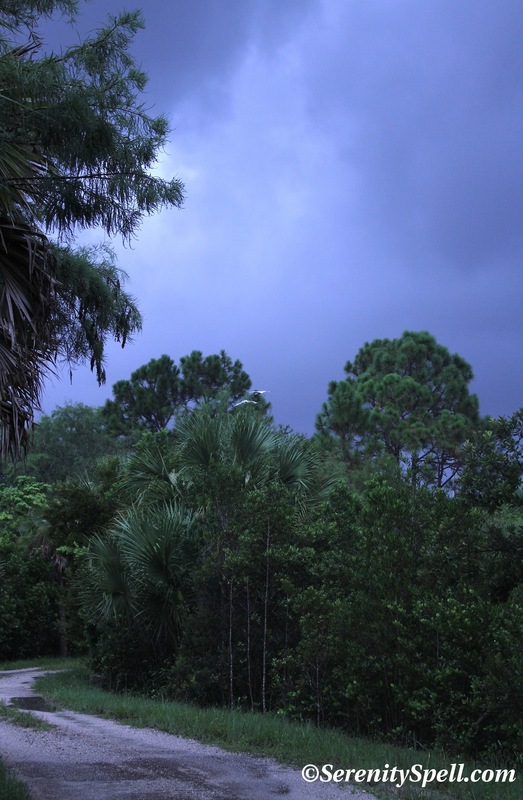 On an especially soggy day — we underestimated the might of the day’s thunderstorms — we pushed ahead with our continued exploration of West Palm Beach’s Grassy Waters Preserve. We hadn’t explored the SWA Trails within the Preserve, and had been searching to see how they linked to the outer Owahee Trail. While we couldn’t do much on this particular day — the rains and lightning proved too much, even for us — we were able to stretch our legs a bit, and visit with hundreds of egrets, herons, and ibis. And even better? I collected feathers; oh, I collected feathers. If there’s anyone in blog-land who’s equally enamored with the loveliness and power of Everglades’ feathers, just holler. I have plenty that I’d be willing to share — and one can make only so many smudge sticks out of found feathers…. Heading into the SWA Trails: We should be good. Sure. Further into the trails: Whoops. Looking a bit dark; where’s our ponchos? 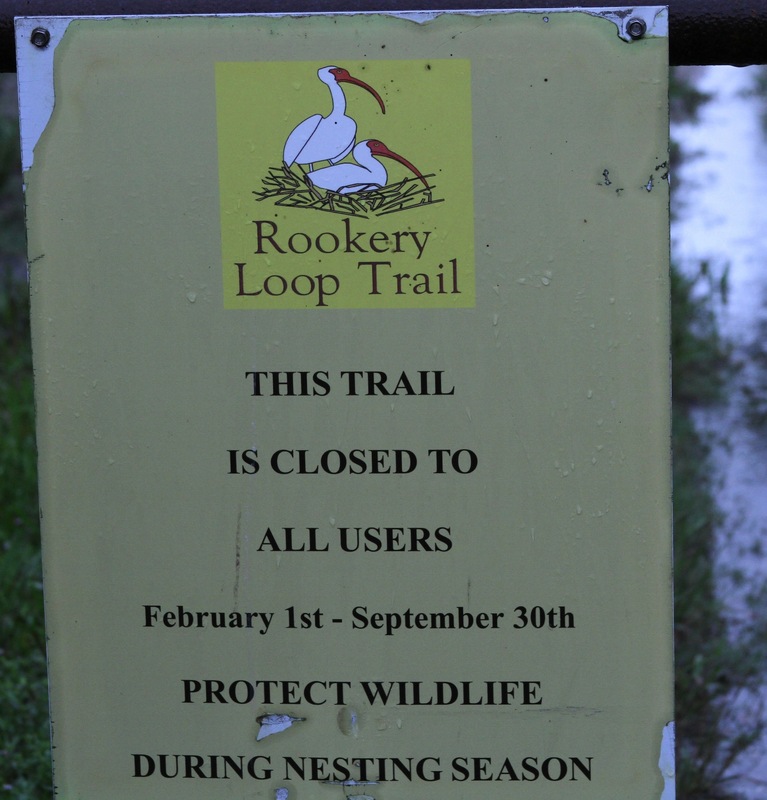 Rookery Loop Signage: CLOSED! Nooo…! But how wonderful they’re protected. And, of course…. An alligator encounter! This guy was a juvenile, very small. But most amusing about him (her?) was that, as I was praising his loveliness and snapping shots, he swam ever closer. Unbeknownst to me, my guy had silently crept up to take a peek, and this little gator’s calm demeanor suddenly changed — he thrashed wildly in the water, like a bezerker on acid. We both jumped like jackrabbits, and the human male skulked away, muttering something about a “big dumb lizard”…. I think he was just jealous. 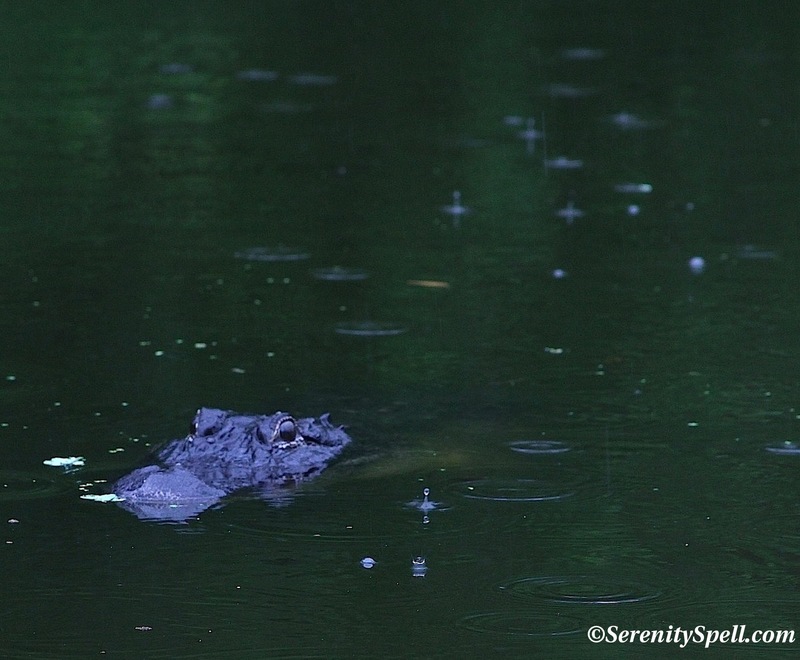 And as if on cue, up popped the gator, swimming back towards me for another cooing session. ← Anoles of the Rainbow — and a Newly Discovered Color Variant! Love the Blue Heron shot and the eyes of the gator!!! 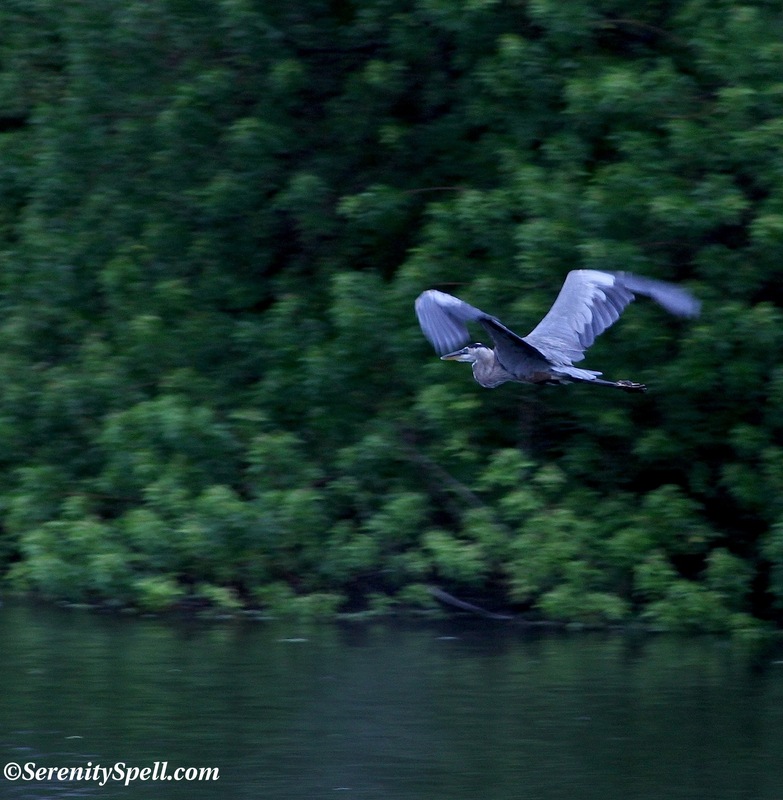 The flying Great Blue Heron looks soooo graceful!! It a nice angle on that shot. I also am fascinated with the feathers we are graced with finding from time to time. 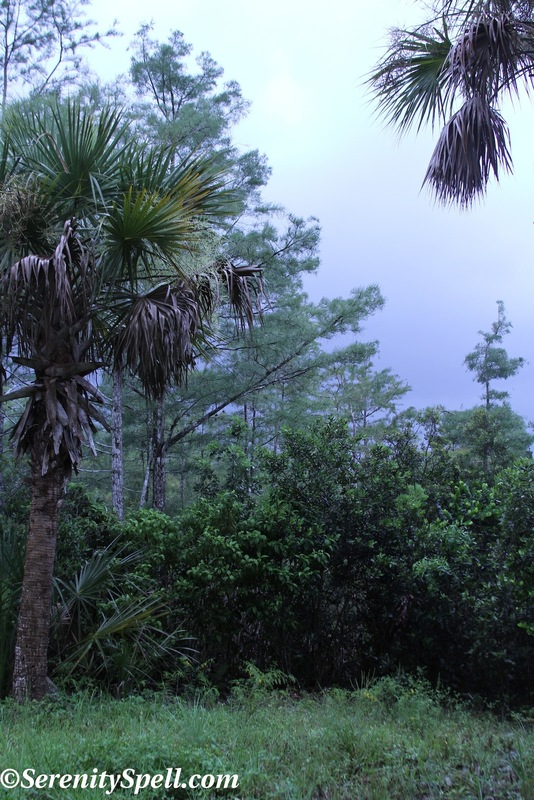 Once when I was in the Big Cypress area I happened upon a lovely Great Blue too late for a picture. But, when I reached the ground where it had lifted off from, there was the most perfect big gray feather. My little grandaughter loves things from nature so I specially packed the feather up for her. It is now a little girl’s treasure. Somewhere along the line I was searching for something on the web and found a place that said it was illegal to possess a Great Blue Heron feather. I understand the rationale given past behavior as regards the Egret aigrettes, but we will save the beautiful feather just the same. And, I hope I don’t get busted for saying that if I find another that I would do the same. That was an amazingly fortuitous shot — whipping around and simply catching him! I didn’t even see the lovely guy, just heard him. No time to change the camera’s settings! I was thrilled nonetheless. Oh, I forgot to mention…ditto on that…CLOSED..Noooooo….on the Rookery Loop Trail!!! I mean just the name makes my heart beat faster!! 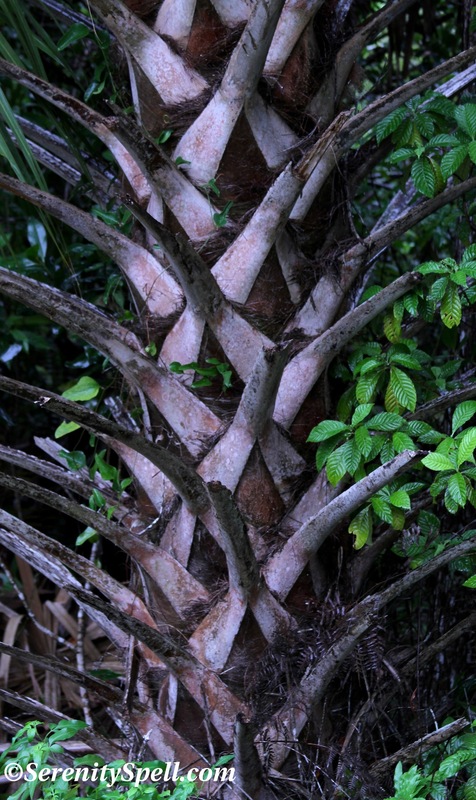 I am really loving your blog and all the info about the FL Everglades flora and fauna. And the great shots. If you ever want to get rid of some feathers, give me a shout. Great Photos – Happy Friday! Thanks so much!! Hope you’re having a wonderful weekend…. How do you always manage to find more beauty?! Just love going on these hikes with you. You’re so kind! We’re exceptionally fortunate to be so near such an amazing and unique ecosystem… ♥ And I’m thrilled to share. I love that last picture of the gator! That seems like a long closure on that trail, but it’s a very good thing! What amazing shots! Love the heron flying. What a wonderful place you live in, thanks for sharing with us. Absolutely hysterical about the gator checking you out. Testosterone will get you every time. LOL. Humm..another feather collector we have way too much in common. One day I brought feathers home found on a hike and quickly discovered I was a felon. They belonged to a Barred Owl. OOPS! I’ve heard this… Animals responding better, or more gently, to females than to men due to the testosterone levels. But I’ve never witnessed anything QUITE like this — hahah!!! Another felon! I don’t understand. The feathers will simply be lost to the muck… Although, I’ve only found one owl feather in my ventures — you’re so lucky, felon! I knew about the American Indian link… But you have a FANTASTIC idea. I have many hawk feathers (or…DO I?!?). Next time: photograph the scene, sheesh! It’s not as though I have a really heavy Canon hanging from my neck or anything. LOL ! Thus the Canon G12. Great quality and fits decently enough in your pocket. I think either way the officials don’t care. Heh heh! I’m glad you enjoyed as much as I did — thanks so much for your kind words!! 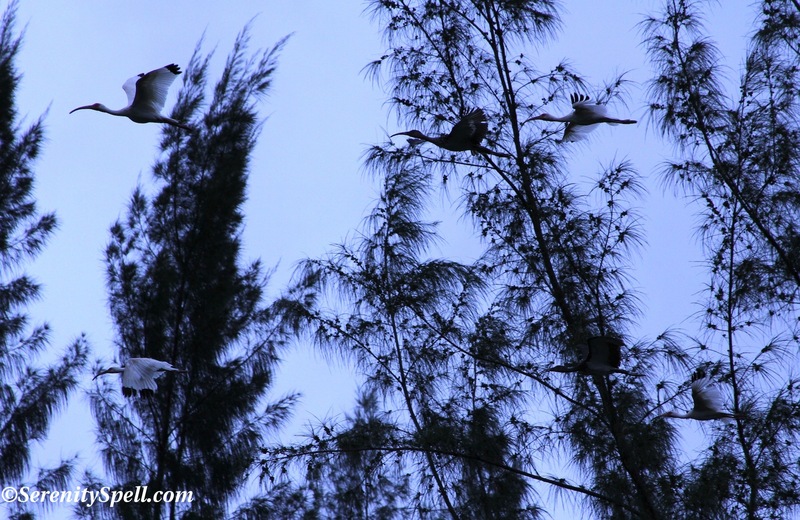 We were thrilled to run across these hundreds of birds… It was an amazing sight. Shame it was SO dark! Ok Gals… There may be something to your testosterone theory of animal behavior (grin), but I have always found if I sit or stand very quietly, animals will come right up to me. Often as not, they are curious. Still, when an alligator is sliding through the water your way, it’s hard to avoid a slight increase in the rate of the old ticker. I was actually introduced to that theory by a MALE nature photog — I can see how it may resonate a bit, sure. There’s some validity / info when I researched the theory. Of course I hype it up in the presence of the male on our hikes for the perturbance factor. And he always says exactly what you do (rationally so)… Being still will draw any critter. 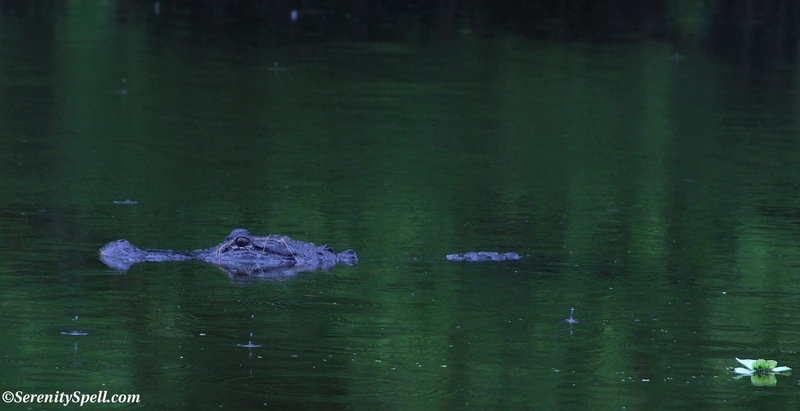 The gator’s reaction was more than I’ve ever seen, though — typically, unless they’re fed (which this one wasn’t, being in a remote swamp), they’re NOT curious of humans. And he definitely didn’t like boys. HAH! FeyGirl, some amazing photos. The great blue heron and the flying ibis shots especially. Real artistry in the compositions. You’re so very kind — many thanks! There are many lucky shots; we go on weekly hikes in our Everglades’ wilds, and I’m thrilled to catch *anything. * The herons and ibis were caught at a moment’s notice, so I’m glad they transpired into worthy images. “Lucky”? Sure, but also you must be out there, open and ready, and with a good eye. So your “artistry” is present as well. This is also such important work- bringing this precious- and vulnerable- environment to all of us through your words and images. You’re so kind — and very intuitive! That’s exactly why I began this project… This is the only ecosystem of its kind in the entire world, yet we’ve nearly destroyed it. There are moves to restore the lost portions (the sugarcane fields), and to continue to preserve the other areas, but every little bit I can do to show its beauty and its inhabitants… I will. We’re all here together!! I love these days – this particular day was a BIT much, but usually… We gotta take advantage of the clouds when we can!! You know that, living down South….